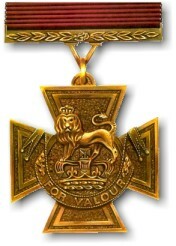 The Victoria Cross is Britain’s highest award for valour in war. One its holders, Fenton John Aylmer VC (1862-1935), is honoured here. Fenton was born at Hastings in Sussex on Saturday, 5 April 1862. His father, initials also FJ, was an army captain also, in the 97th Regiment. We know Fenton had a brother. He married late, to Elsie in 1913, and was apparently childless. Fenton was a career soldier, joining the Royal Engineers in 1880, and a highly successful one. He served in colonial wars in Burma and India in the last years of the 19th century, doing the things that late-Victorian colonial soldiers did. He progressed to Colonel in 1899 and, by his retirement from active service on 25 February 1919, to Lieutenant-General. He served as Colonel Commandant of the Royal Engineers from 1922 to his death. 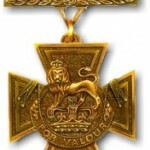 As well as the Victoria Cross he was mentioned in dispatches five times, including his valiant efforts in the Mesopotamia campaign of 1916 – the year he was invested as Knight Commander of the Order of the Bath (Military Division), KCB. Fenton also qualified as a Writing Aylmer, producing the still sought-after Aylmers of Ireland and what was no doubt a valuable pamphlet of its 1911 day, French views on the tactical employment of field artillery. He died in Wimbledon, London, on 3 September 1935, and is buried in Golders Green Cemetery. ‘On 2 December 1891, an expedition sent into the Hunza Nagar country arrived at the Nilt Fort. The force consisted of about a thousand men, mostly Kashmir Imperial Service Troops, and sixteen British officers. ‘The Fort which had to be attacked, standing at the extremity of a ledge which overhung the Nilt nullah, was protected on three sides by a precipice, and the only approach to the gate had been strongly defended by abattis of branches. It was impossible to bring the mountain-guns to bear on this part, owing to the impracticability of dragging them up the cliffs which overlooked it, and for a long time a hot rifle-fire was kept up by the men, which was equally severely replied to by the enemy. ‘At length it was resolved to take the Fort by storm, and, to enable an entry to be made, the great gate had to be blown in. This dangerous duty was entrusted to Captain Aylmer, in command of the Engineers, and he was supported by a hundred Goorkhas, under Lieutenants Boisragon (VC) and Badcock. ‘While the Goorkhas hacked at the branches of the abattis to make an entrance, the three officers, with a small handful of men, sprang through the opening and forced the gate of the outer wall. Captain AyImer then, in a most cool and courageous manner, advanced under heavy fire and placed the charge of gun-cotton against the main gate and lit the fuse. Just before he retired to await the explosion he was shot in the leg. The charge failed to ignite so he returned and arranged a fresh charge and re-lit the fuse. He was again severely injured in the hand by a rock hurled from above by one of the enemy. ‘The explosion was sufficient to blow in the gate, and the officers, followed by their men, dashed through and commenced a terrific hand-to-hand combat with the defenders, who, after a most desperate resistance, were driven from the Fort. Another example of Fenton Aylmer’s bravery was given by Captains G. J. and F. E. Younghusband in ‘The Relief of Chitral’. ‘During the construction, a very prompt and plucky act on Major Aylmer’s part saved the life of a soldier. About a mile up stream, where the first floating bridge had been constructed, a flying-bridge and rafts were still working backwards and forwards to supply the Guides with their wants on the other bank. One of these rafts, on which were two men of the Devonshire Regiment Maxim Gun Detachment, got accidentally overturned, and the boatmen and oars were washed away. The two soldiers managed to climb on to the raft and were carried down stream at a great pace. ‘General Gatacre, seeing the accident, immediately galloped down to the site of the new bridge to give warning, in the hopes of saving the men. Meanwhile one of them had made an attempt to jump on shore and had been swept away and drowned, and the survivor on the raft came flying down the torrent. With the greatest presence of mind Major Aylmer immediately slipped down a slack wire that was across the river and just managed to grab the soldier as he shot past. The raft was immediately after dashed to pieces on the rocks below. With considerable difficulty they were both hauled on shore and it was then found that the Major was badly bruised and cut by the wire. Thanks to Richard Arman for his help in researching this article.